Do we really want this salvation? And so we come to this, the day when Jesus suffered and died on the cross. Those who just a few days before welcomed him into Jerusalem with cries of “Save us, Son of David!” – remember, that is the original meaning of Hosanna – “Save us” – have now decided they don’t want to be saved. At least, not the way Jesus offered to save them … through love and service to one another, through healing and foot-washing, through inclusion instead of exclusion, through praying for enemies and going the extra mile. No, God’s salvation on earth was not the thing that caught the public imagination, not the way that people wanted to go. And so they turned from begging to be saved to begging to get rid of the one really good thing they had going in their lives. The “they” of whom I speak here, I want to be clear, are not the common Jews of the day, who lived lives of oppression and suppression, both from the Roman occupiers and their very own leaders. No, the “they” of whom I speak are the Jewish leaders themselves, the ones who conspired time and again to get rid of this pesky preacher from Nazareth. They didn’t like the fact that he was upsetting their apple cart, that he challenged their power, that he called them to account for all the things they had done and did and would do that were focused only on keeping themselves in power, and not on caring for God’s beloved children. They are the ones who incited the people. They are the ones who had Jesus arrested. 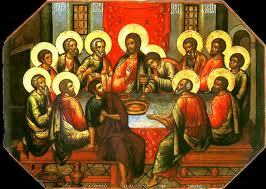 They are the ones who presented him to Pilate. They are the ones who desperately wanted Jesus gone. Because they did not want to lose control. They did not want to let loose the reins of authority. They did not want to admit that perhaps, just perhaps, their policy of keeping their heads down and letting the people go hungry, go thirsty, be sold into slavery was wrong on every level known to God. This particular scriptural recounting of Jesus’ death, the one from John’s Gospel, has been used over the centuries to blame the people for Jesus’ death. And with that blame came the seeming authority to thus blame all Jews for his death. And with that seeming authority came the seeming permission to harass and harm and slaughter the Jews. All because no one bothered to figure out who “they” were. But we know who they were, don’t we? And we know who they are, as well. Because sometimes, those people are us. Sometimes, we are the ones who don’t want to give up control, who don’t want to let loose the reins of authority, who just want to keep our heads down and if others don’t have enough to eat, or drink, or are sold into the slavery of poverty and addiction, well … that’s the price we sometimes are willing to pay, isn’t it. Sometimes, we are the ones willing to let a good man die, so that we can be saved from his kind of salvation. But that salvation, my friends, is not the salvation that God offers us, especially not on this dark day, when Jesus was hanged on the cross in the most painful manner of execution the Romans could apply. An execution that could take hours, or even days. One that frightened whole populaces into obedience, because no one wanted to die that way, and one that frightened the Jews even more, because the Hebrew Scriptures condemn this sort of death. The salvation that God freely offers us – because of this man’s willingness to die for us – can be summed up in this very manner of death. Love one another, as Jesus loved us. Be willing to live for each other so much that we are willing to die for each other. It is a tall order, one that seemingly cannot be fulfilled by mere mortals. But when you break it down, when you look at exactly what Jesus showed us to do, it’s really not that hard after all. For all we have to do is feed the hungry, give water to the thirsty, sight to the blind, hearing to the deaf, voice to the voiceless. All we have to do is cure the sick and make the lame leap for joy. All we have to do is include the excluded, touch the untouchables, love the unloved. Jesus spent his whole ministry showing us how to do that. And then he died, because he did what he said he would do. So while the actual doing is not that hard, just remember: It could lead to our deaths. Because even if we aren’t the ones who are in control, even if we are not the ones who refuse to give up control, there are others out there – a whole world of others out there – who do not want us to carry on Jesus’ mission and ministry in this world. And those people who do not want us to care for each other, to love one another as Jesus loved us? They are just as ready to get rid of us as the old leaders in the old days were ready to get rid of Jesus. So be forewarned: We can cry out to He Who Saves “Save us!” all we want. But if we really want this salvation, if we are really willing to do everything we can to help those in need, to love the unloved, to change the world into a place where there are no unloved, watch out. Because someone out there is not going to like it. And that someone might just crucify us as well. Do we really want to be saved, in the way that Jesus saves us? Because that salvation comes with a price. And it could cost us ours as well. Is this the salvation we want? If you had been standing at the foot of the cross and saw the man you called “Lord,” the man you believed was the Son of God, crucified and dying, what would you think those words meant? If all of your hopes and dreams were pinned on this one man, the one you had followed throughout Palestine, the one you listened to so closely, the one you watched cure the sick and raise the dead … what would you think those words – “It is finished” – meant? Would all your dreams be dying up on that cross with him? Would all your hopes die up there as well? Mary stood at the foot of the cross – Mary, Jesus’ mother. Surely she thought this was the end of all her hopes and dreams, watching her child die. What would you have thought, if you had been at the foot of the cross that day 2,000 years ago, outside the gates of Jerusalem, when you heard Jesus say, “It is finished”? My brothers and sisters in Christ, on this Good Friday, 2,000 years after that day when Jesus died, we are standing at the foot of the cross. I want you to pay no attention to the fact that we already know (or, we think we know) the rest of the story. Forget about Easter morning for a moment, and concentrate on what it is like to stand at the foot of the cross. This is the way John tells the story. There’s a different take that we have to examine on this particular Good Friday. This is no sigh of defeat. This is not a cry of despair. This is Jesus as John saw him, Jesus a man on a mission from God, a man who knew, from the beginning, exactly who he was, and what he was doing, and why he was doing it. In John’s Gospel, we see a triumphant Jesus hanging on the cross, doing exactly what he was called to do, clear-minded, with a single, driving vision of which he never lost sight, from which he never wavered. Nowhere in this Gospel do we hear any pleas for release, any prayers to “remove this cup.” Nowhere does Jesus doubt that this moment on the cross is exactly what God planned, exactly what he was supposed to be doing. John’s telling of the arrest, torture and crucifixion of Jesus is confident … vibrant … even a bit sassy. At the Garden where they came to arrest him, he identified himself as “I AM,” taking for himself the name of God. He gets no help carrying the cross to Golgotha. After that, knowing that it was finished, he said, “I thirst” – in order to fulfill the Scripture. And then he bowed his head and breathed his last. Do you hear anything of defeat here? Because this is John’s Gospel, and in John’s Gospel, Jesus knows exactly what he is doing, every step of the way, every moment of the day. “It is finished” is not a plea of defeat. It’s Jesus cry of triumph! Now … understanding that in John’s Gospel, Jesus is a determined man on a mission from God … standing there at the foot of the cross with the women and the Beloved Disciple … now tell me, what exactly do you think Jesus meant when he said, “It is finished”? Yes, Jesus died a terrible, painful, brutal, humiliating death. Do not lose sight of that. But Jesus didn’t look at it that way – not in John’s Gospel. For Jesus, “It is finished” is a statement of glory. Which means that when we hear Jesus say, “It is finished,” what he’s telling us, from that pain-filled place on the cross, is that his job is over. He has shown us how to live – in love. And he has given us a vision – the vision – on which we are called to focus, every moment of our lives. Everything Jesus did, everything he said, everything he taught, every miracle he performed and prayer he prayed was done in the sure and certain knowledge that this is what God wanted done. Just as Jesus never wavered, so we are not to waver. 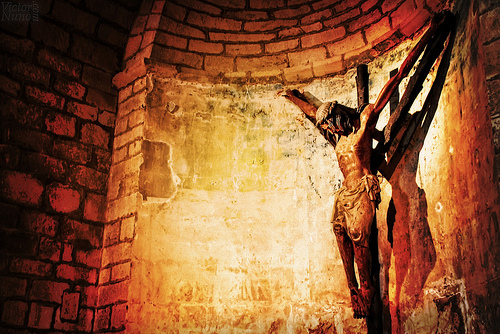 Yes, we are called to witness the crucifixion this day, to wonder and cry. And we should be filled with trembling. We should be trembling all over! Because Jesus just turned the whole job over to us! He’s given us the whole shebang! Everything he did? All that preaching and teaching and healing and bringing back to life? … Now we are the ones who have to do what he did, we are the ones who have to take up our own crosses, we are the ones who have to die to all the things that get in the way of our lives in God! Now we have to preach the Gospel, the Good News of God in Christ Jesus! Now we have to teach the world how to live in unity and peace, instead of discord and war! Now we have to heal the sick and bring life – new life – to all those who live in death! We are the ones who are to give hope to the hopeless, who are to love the unloved, who are to fulfill the dream of God. So yes, we should be trembling right now, because Jesus just put all his work on our shoulders and in our hearts. And that frightening thought should make us tremble! Robert Fulgham once famously said, “All I really needed to know I learned in kindergarten,” and in many ways, that is true. But the reality is, everything we really need to know? We learned it all from Jesus. That’s why Jesus was so triumphant on the cross. Because his part – his earthly part of teaching us, of training us, of inspiring us? That’s done. Jesus had a job to do and he did it. Now, he’s given the job to us – and trusting us to do it. So, yeah, we should be trembling – heck, we should be quaking in our boots right about now! Because we have no more excuses. Jesus was a man on a mission from God, and he wants us to go on that mission as well. It means that from now on, we have to do the work that Jesus did, because Jesus has called us, because Jesus trusts us, because Jesus is counting on … us. We are on a mission from God, my friends. It’s not Jesus’ job any more. His part? It is finished. Over with. Done. Fini. Now? Now it’s all up to us. Sermon for Good Friday, 22 April 2011, Year A, Trinity Episcopal Church, Arlington, Va. 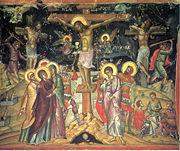 Filed Under: Blog Articles, Featured Story, Good Friday, Holy Week, Scriptures, Sermons Tagged With: "It is finished. ", Beloved Disciple, Confidence, Glory, Good Friday, John's Gospel, Mary the Mother of Jesus, Mission, Redemption, Restoration, Were you there when they crucified my Lord? What are you going to teach? What word are you going to give to sustain the weary? God has told us the Good News that he wants proclaimed. He has given us the words that need to be spoken, especially in this intense period of time, when we are about to face our deepest fears and experience our harshest terrors and most intense grief. God has called us – each and every one of us here – to speak the truths that need to be spoken, to proclaim the grace that so many are dying to hear. This is our holy calling, something of which we need to be reminded in this Holy Week. For God gave us the tongues to teachers in order that we may speak God’s message of love and reconciliation, of justice and peace. God has given us the tongues of teachers so that we can proclaim to the world, to all of God’s creation, God’s dream for us, a dream of lives lived in love, not hatred; of lives filled with enough instead of lives lived in desperation; of fairness for all the people, and not just the select few. … even if it costs us … our jobs, our homes, our families, our freedom, our lives. And God knows, it will cost us to speak God’s word to the world. We know that it will cost us … because we know the world (and sometimes, remember, that means us) does not want to hear God’s message, does not want to listen to what God wants, does not want to live in love or peace, and refuses to give justice, or even just enough, to those in need. Jesus knew this particular truth. He knew the powers-that-be did not want to hear what he had to say, because then the powers-that-be wouldn’t be in power, would they? For they would have to give up all that they had in order to received all that God had to give. So Jesus knew what was coming – he told everyone repeatedly that he would die for what he proclaimed, for what he represented, for what he was. The Lord God opened his ear, and he was not rebellious, he did not turn backward. Even when he was betrayed by one of those whom he had called to discipleship. To be faithful, even when we feel betrayed. Even when we are mocked. Even when the world rejects us, spits on us, tries to beat us down. Who will contend with me? Let us stand up together. Who are my adversaries? Let them confront me. It is the Lord God who helps me; who will declare me guilty? God has called us – each of us and all of us – to proclaim God’s word, God’s will, God’s dream for all of God’s very good creation. Our call, especially in this week, this holy week, when much of the world is either looking for chocolate eggs and giant white rabbits or is too frightened and weary to do much of anything but cower in despair, our call is to stand firm in our faith, to proclaim the Word and the love of the Lord to all people, to do the right thing no matter what. It’s a weary world out there right now, folks. Trust me – bad news batters us daily, the economy scares us, our enemies are trying to terrorize us into submission. God is calling us to sustain that world. God has equipped us to do so. So in this Holy Week, be strong, speak boldly, and live in the love that God has given us. A sermon preach on Wednesday in Holy Week, 20 April 2011, Year A, at The Church of the Good Shepherd, Burke, Va.